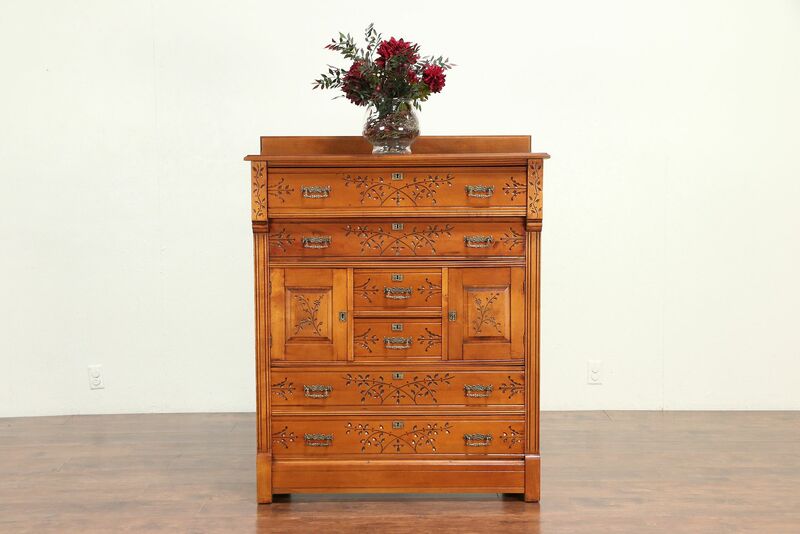 A highboy or tall chest of drawers from the late Victorian or Eastlake period dates from around 1880. Incised "spoon" or chip carving and round "pin and cove" dovetail joints are characteristic of the era. The restored finish is in excellent condition, preserving a few shrinkage separations for a little antique character, see photos. American made of solid maple hardwood, doors have raised panels. Embossed solid brass hardware is original, there is a key for the doors only. Size is 41" wide, 19" deep and 51" tall.